[UPDATE 4: the driver update which re-enables overclocking will be released tomorrow] A well-known vBIOS modder confirmed the recent reports: many of Nvidia's GTX 900M series GPUs in new gaming laptops ship with a vBIOS that prevents overclocking. Things are not looking good for Team Green right now. The GTX 970 VRAM scandal ended up in a class-action lawsuit against Nvidia and its partner Gigabyte as the company's GeForce forums have just been starting to calm down after a recent driver update disabled overclocking (which the company subsequently promised to re-enable next month). However, the storm is now back in full force: recently, some buyers of new gaming laptops outfitted with GTX 900M series graphics cards have complained that they weren't able to overclock their GPU(s) even using the last lock-free driver (ForceWare 344.75) - the corresponding sliders were simply greyed out in the Nvidia Inspector utility. A well-known modder Prema, who maintains a website offering modded BIOS and vBIOS files for a variety of hardware, has now confirmed this suspicion: his new Schenker laptop with a GTX 980M GPU exhibited the same symptoms. According to him, the lock is now hidden in the vBIOS, a graphics card's low-level firmware responsible for exposing the hardware features of the GPU to the software. This firmware can only be flashed via a relatively risky process before the operating system boots, so this lock couldn't have been introduced through any downloadable update. It seems that Nvidia actually started shipping GTX 900M GPUs with the lock-enabled vBIOS to various laptop manufacturers (Dell Alienware and Clevo also seem to be affected) some time ago, possibly predating the scandalous driver update. Naturally, Nvidia's GeForce forums are once again full of very annoyed customers demanding an explanation. So far, none has been provided. Although Prema is allegedly preparing to release older vBIOS versions for the affected GPUs, flashing the GPU firmware is not likely to be attempted by a lot of people. As we mentioned above, the process is rather risky and just like with a BIOS update, its failure can lead to a completely unbootable system. 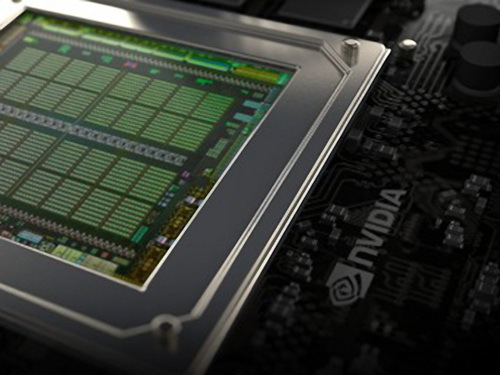 What's even more worrying is the direction Nvidia is headed in: should their next-generation GPUs have the overlocking disabled from launch in the vBIOS and prevent its modification, there will be absolutely no way left for enthusiasts to overclock their mobile graphics. While Nvidia's alleged concern with thermal development seems valid, some bulky 17-inch gaming laptops in fact do allow for some GPU overclocking without overheating, making the employed lock unwarranted. It would be interesting to know what really pushed the company towards such a step - was there an unusually high number of warranty claims from overclockers accidentally overheating their cards or is there another reason? Either way, we fully expect Nvidia's rival, AMD, to take full advantage of the situation. The company has already offered discounts to GTX 970 owners but unlike in the desktop GPU market, it can't provide a similarly performing solution for laptops and thus has no way to to win the laptop gamers over for now. Nevertheless, many laptop enthusiasts stated that they will not purchase an Nvidia-powered gaming laptop that doesn't allow overclocking - perhaps there's still a slight chance that the company might truly change its mind, but it's dwindling every day. [UPDATE 25.02.2015]: Nvidia has replied to our query about this matter. Details follow below. Immediately after receiving the news, we have contacted Nvidia and asked for clarification. The company has replied stating that the feature set of the GPU is the responsibility of the OEM and that there are no plans to somehow regulate it or enforce any defaults (such as allowing or disallowing overclocking). We have then contacted Schenker, who told us they're waiting on a clarification from Clevo (who supplies barebones for Schenker) themselves. MSI has sent a request to Taiwan but the reply might take some time due to ongoing Chinese New Year celebrations. Alienware was contacted as well but so far hasn't replied. We will update our readers once we receive more information from any of these companies. It should be also pointed out that the lock also prevents manual downclocking, which, while rare, is useful for energy saving or playing older games where a lower clock is sufficient for smooth framerates but allows the GPU to heat up less, thus decreasing thermal and acoustic emissions. [UPDATE 2 27.02.2015]: In the meantime, we have information from several manufacturers on this topic. 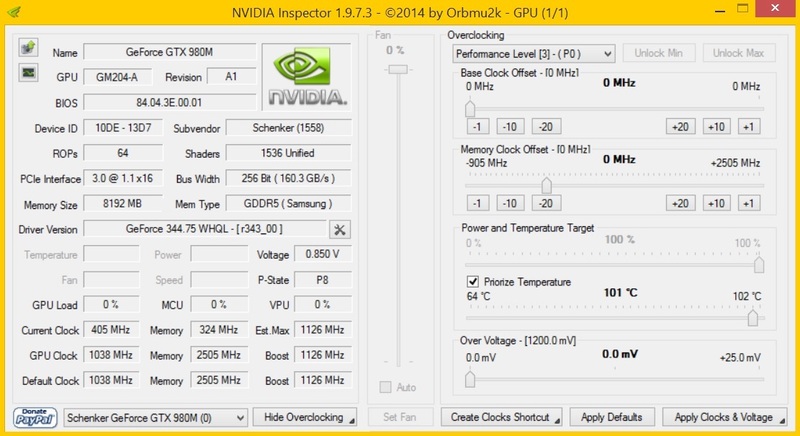 Our sources prove the initial suspicion that overclocking in the GTX 870M and 980M had indeed been blocked in the vBIOS. However, Nvidia and leading manufacturers of gaming laptops also made a clear concession for overclocking. The vBIOS-locked cards will likely stop shipping once the GPU driver update Nvidia has previously promised is released. Nvidia has also confirmed this on our request. It remains to be seen, however, whether this also applies to non-GTX graphics cards. [UPDATE 3 06.03.2015]: New information that reached us today states that the driver update which re-enables overclocking could be released on March 16. Unfortunately, it of course won't remove the vBIOS lock, but at least shipments of GPUs affected by it should be discontinued. [UPDATE 4 17.03.2015]: We just received information that this driver update (347.88 WHQL) will be released tomorrow.